Chrysoprase is mentioned, in the Bible, as the tenth foundation gemstone of the New Jerusalem built by God (Revelation 21:20). The name of the gemstone comes from the Greek word chrusoprasos (Strong's #G5556). Strong's Concordance defines the word as a greenish yellow gem, while Thayer's states it is a green stone "inclined to that of gold." Chrysoprase is not mentioned in the Bible either as one which was embedded in the High Priest's breastplate (Exodus 28:17 - 21, with parallel list in Exodus 39:10 - 13). Chrysoprase is also not mentioned in the Bible as a gem that Lucifer was created with (Ezekiel 28:13). Eight out of the ten major Bible translations used in this series translate chrusoprasos as "chrysoprase," while the other two refer to it as "chrysoprasus" (they are equivalent terms). Chrysoprase is a quartz-based precious stone that is a variety of chalcedony. The gem, commonly used in necklaces, receives its apple-green color from nickel. 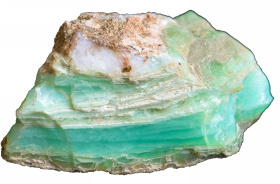 Placed against the body, chrysoprase was believed to produce shivering and chills that began in the chest region and spread to the entire body. Additionally it was once believed that thieves, sentenced to be beheaded or hanged, who placed this stone in his mouth, would be able to escape their executioners as if they were invisible (Curious Lore of Precious Stones, pages 11, 67 - 68). How does gold fulfill prophecy? Who did the Eternal personally execute?